Going traveling with your toddler and wondering where they will sleep? Although it is certainly possible to book hotel rooms with enough beds for everyone, this is often expensive so we like to travel with our own portable toddler bed. This saves money and gives us more choices when we are booking accommodation. A toddler portable bed has been especially designed to make it super easy to travel with. These toddler travel beds are compact, comfortable and easy options to ensure you have a great sleeping environment for your child everywhere you go. We just about always travel with our own travel bed for toddler and have tried out several alternatives. 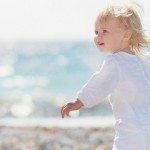 After all my research and experience, I have written this guide to choosing the best toddler travel bed to hopefully help you make a smart choice. 1 What is a toddler travel bed? 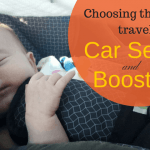 2 Should you travel with a toddler travel bed? 6 Looking for portable bed rails for toddlers? What is a toddler travel bed? If you’re not sure exactly what a toddler travel bed is, it’s important to understand the difference between a travel crib and a toddler travel bed. There are many types of travel bed for toddlers, and you need to find the right option for your little darling. Basically, a toddler travel bed is best described as being a portable bed for toddler use, one which doesn’t have high walls and doesn’t really do a lot to contain your toddler. If you have a particularly active little bundle of joy then a larger travel crib might be the best option, but this is a personal decision. Basically, this is a kids travel bed which can also be described as a fold up bed, and there are several different types to consider; one is an air mattress for toddler use, others are mattresses that fold straight out while others require assembly before use. It’s important to consider the personality and activity level of your child before deciding which type of bed to go for, and to consider the type of travel you’re thinking of enjoying, so you can pick a method that isn’t going to cause you a headache when you arrive at your destination, when you’re keen to get everyone settled and sleeping! Should you travel with a toddler travel bed? As with everything in life, there are pros and cons to travelling with portable toddler beds. Our toddler or preschooler gets to sleep in a safe bed which is age appropriate. We don’t have to limit ourselves to only booking family rooms when we travel. They also have a spare foldable toddler bed for when we are at home. There are many options like a toddler inflatable bed or toddler camping bed which makes it easy to pick something they will like. Buying a travel bed especially made for toddlers means we get something more compact compared to buying one for older kids or adults (which obviously need to be bigger) as traveling light is important to us. It’s another item to take travelling. Here is a quick comparison of the best portable beds for toddlers, with information such as the weight of the toddler bed, the age range, the price and our rating. Below you will find our travel toddler bed buying guide and toddler travel bed reviews of each of the traveling beds for toddlers below. Another alternative for toddlers can be a travel crib – which is best really depends on the kid’s age, size and your preferences. If your child is 1 or you are looking for a travel bed for a 2 year old, then a travel crib may be the best option – these are designed to be more crib like and will do a better job of keeping your kid contained. Once a child is used to sleeping in a toddler bed or single bed at home, however, a fold away toddler bed can be a best option. A toddler travel bed should suit your child for longer and is usually cheaper and more compact than a travel crib especially if you look for an air mattress for toddlers. If you are considering a travel crib, you can read our full guide here. If you like the idea of a pop up toddler bed – this is a collapsible toddler bed which basically folds away and then pops up again when you pull it out – check out the KidCo Peapod in our travel crib guide. This is quite large and will fit your child throughout their toddler years. It’s a good alternative for older kids that you still want to keep contained. It is kind of like having a small tent for your kid – our kids think it’s lots of fun! When choosing the best possible toddler travel bed for your child, it’s important to first assess how they will react to sleeping in such an environment. Is your child active? Does he or she need containing in a more rigid setting, e.g. a crib, or are they able to sleep in a bed such as this, without much in the way of containment. Once you have this decision, it’s time to look at the various elements which make up your choice. An inflatable toddler bed requires inflation and deflation whenever you put it up and take it back down again which can be a bit of a drag. However they are also more compact and easy to transport around in the first place – these can easily fit into your airplane luggage. Comfort-wise, a toddler blow up bed can either be ultra-comfortable, or it can be a little on the unsupportive side, and this is again something which is personal to your child. You can also choose to buy a self inflatable mattress. These have the benefit of being ultra compact – they don’t have side wings, they aren’t thick and don’t require inflation. However, they also are not very comfortable and don’t contain the kids at all – we find our kids often don’t end up actually sleeping on it – they usually roll off. If you go the self inflatable option, I recommend a kid sized option as these will be far more compact. You don’t need one that is adult length for a child. One option is the Coleman Youth Self Inflating Air Mattress. The second type of toddler travel bed is the folding variety, and again, there are pros and cons. The major plus point to a folding travel bed is that they are infinitely more comfortable, and quite supportive for your child’s back whilst sleeping. Folding beds come in two varieties – one which is ultra easy to use, they simply fold up with no need to inflate. Others, such as the Regalo My Cot, require some assembly. On the downside? Folding beds, particularly ones that just fold out, are bigger, which means fitting them into airplane hand luggage can prove impossible. They are better suited for use around the home and road trips. Size should play a huge part in choosing which traveling toddler bed to use, especially if you are flying because the choice you make has to be small enough to fit in your luggage. You need something which is easily transportable. Inflatable choices can be good since they are usually more compact. On the other hand, folding travel beds have a tendency to be larger to transport around. If you are heading off on a road trip, this may not matter – most toddler folding bed options will fit into the trunk of a car so you have more options. Obviously, you also need to assess the size of your child, because they need enough room to be comfortable and there is not much point buying a toddler bed that only just fits your child and needing to buy another one next month. Age range is another important aspect, and it is imperative to pick one of the toddler travel bed solutions which fits your child’s age range. Thankfully, most options on the market have a large age range, e.g. you can use from around 2 years upwards. It’s usually not a good idea to use a toddler travel bed for a child younger than two – they are much better suited to a travel crib. Another important aspect is ease of use. It’s no good buying an all singing-all dancing option which you struggle to either inflate or put together. 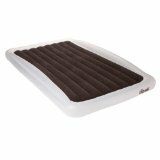 Most toddler air mattress options are quite easy to put up, but you will need to inflate and deflate as you travel. It’s also a good idea to look at a toddler air mattress with sides, because this means your child has a bit more in the way of support whilst they are sleeping. 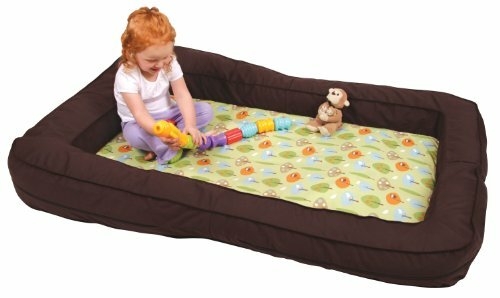 Conversely, a toddler fold out bed can be ultra easy to use – ones like the Leachco BumpZZZ just fold out. Others, like the Regalo My Cot, require a bit more effort. Again this is a personal decision based on your particular child and his/her personality. However when picking a toddler fold out bed in particular, it’s important to look at how easy it is to put together and take back down again. You don’t want to end up frustrated every time you have to set it up. Many inflatable beds are extremely comfortable, however many don’t give a child as much support whilst sleeping. On the other hand, folding toddler beds give support and are more comfortable overall. If the bed doesn’t have sides, also keep in mind that your child may have problems staying on the bed and may end up spending most of the night on the floor. Every toddler travel bed on our list meets American safety standards. However, there are some which are safer than others. When picking a toddler air bed, make sure you make a choice which inflates easily, and secures safely too. On the other hand, fold out beds need to be safe to put together, so there is no chance of the bed ‘snapping’ back closed. This is dependent on the age of your child, but for younger children, choosing a bed with sides is obviously going to be safer than one without. In order to offer a little more support and containment, sides are the way to go for children at the younger end of the scale – as long as there is no type of gap where they can get stuck. However, if your child is a little older and isn’t as active, then an inflatable bed, such as a mattress-style, could be the way forward and often have the upsides of being more compact and fitting your child for longer. Looking for portable bed rails for toddlers? If you are planning to always stay in accommodation with enough beds for everyone, then you may not need to worry about buying a fold up toddler bed, but you may need portable toddler bed rails to make sure your toddler doesn’t roll out of the bed! This is actually an inflatable portable bed rail for toddlers meaning it takes up little space and is perfect to travel with. It comes with a compact foot pump and travel bag and is suitable for kids age 2+. This is a great choice for traveling families, particularly ones that like to travel by air. This is a suitable travel bed rail for toddlers because it can dissemble quickly into one third of its usual size. It comes with a travel bag. It’s very easy to use and a good choice for one you can use at home and for occasional travel. Below are our toddler travel bed reviews of the top rated travel beds for toddlers available. The Shrunks toddler bed is a great middle ground choice for those who want something in-between an inflatable bed and a foldable option. 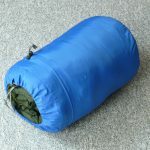 This particular choice can be used as an inflatable mattress for travel, or perhaps to leave at the grandparents. All standard sized crib sheets fit the bed, and there are slightly raised security rails, to ensure your child doesn’t roll out. The Shrunks toddler travel bed inflates quickly, which is its major plus point, and the accompanying travel bag also carries the powerful pump, which allows the bed to inflate fast and easily, without leaving you out of breath. This is a great cheap option, and one which should last you a good few years for your travels. Some cheaper inflatable options may be difficult to inflate, especially for first time users, however this isn’t the case with this particular option. Click here for more information and the latest prices.. This blow up toddler bed is very similar to the option above but meant for slightly older kids. It is also a very cheap way to go, at less than $60; this means you are looking at a very cheap investment for a few years’ use. The Shrunks Sleepover Kid’s Travel Bed fits all standard sheets, so you don’t need to be buying different sheets to fit it when you head off on your travels. Again, the powerful pump which is included in the package has a 1 minute inflation and deflation time, and there is a bag included which carries both. There is also an included repair kit, just in case! The soft and plush mattress gives comfort for your child, and overall this is a very easy option to go with. The one downside, however, is that it is difficult (although not impossible) to fit the deflated mattress back in its bag. Click here for more reviews and the latest prices. 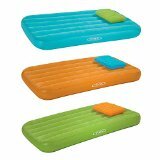 If you don’t like the idea of inflating your toddler travel bed, the Leachco BumpZZZ is a great choice. This lightweight cushioned bed with sides means you can easily fold it up for travel, in the accompanying travel bag, and it is easily washed, in case of any spills. The generous size means your little one will be more than comfortable, with the added comfort of those sides for younger children. 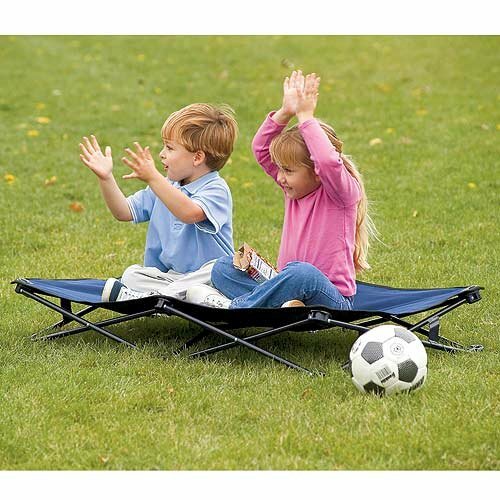 This is a mid-price range choice, however it can also be used as a cushion when doubled backwards, for extra comfort on the go, or a soft place to play. The only downside is that the bed isn’t as compact as an inflatable option, but the extra comfort can make up for this, especially if you will primarily be using this bed for car travel or for an option at grandma’s. Click here for the latest prices and more reviews. The Regalo portable toddler bed is a fantastic option for those who want to avoid the inflatable variety of bed. 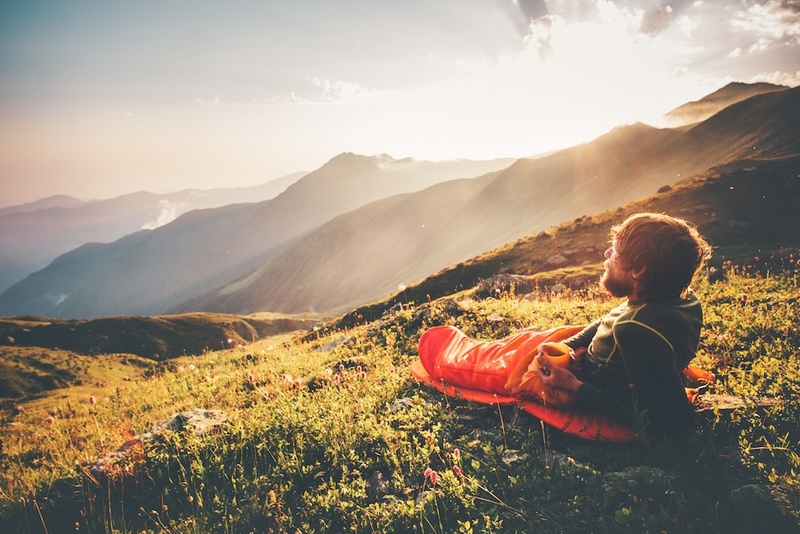 Whilst a fold up option isn’t as easy to pack up into airplane overhead bins, this particular option is quite compact, which allows use for travel, camping and simple sleepovers – a great middle ground option. The bed is made of steel and plastic, with a reinforced canvas bed liner included, and a washable sheet, to clean up any unfortunate messes. Simply fold and go when you’ve finished using it, and snap it back down into place for a good night’s sleep. 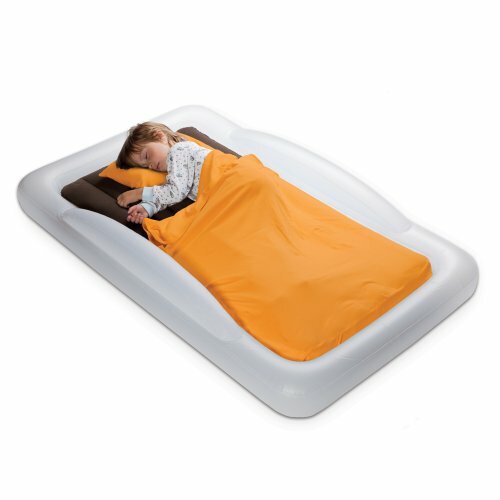 The Aero toddler bed is a fantastic choice of inflatable toddler travel bed. Priced between $50-$100, this is a good investment, and one which is long-lasting. The bed itself is made of heavy duty PVC, with electronically welded seams, so you can be sure that this bed is going to last you for as long as you need it. There is also a 4” safety cushion attached, which helps stop your little one from rolling out of the bed. If you’re worried about the inflation side of things, the included pump inflates the bed in under one minute, very easily, and it deflates within 15 seconds, meaning no time to wait around before packing up on the move. There is a thick, fitted mattress pad included, with a washable cover, prettily decorated with moons and stars, for something a little special. Click here for the latest prices. This is a cheap and cheerful option. It is one which will last and is safe for your child, aged 2 years and upwards. 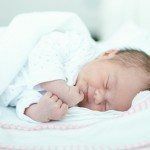 The high sides mean your child will be unable to roll out, and you can use your existing standard crib sheets, so you don’t need to splash out on anything different. This is a great choice of blow up mattress. The included air pump inflates and deflates the mattress quickly and easily, folding up to a very compact size. It is easy to travel with wherever you are going – it will easily fit into hand luggage on a plane or into the trunk of a car. Comfort is optimum with this choice, and although the price is low, it ticks all the boxes you need it to. Click here for more information and the latest prices. 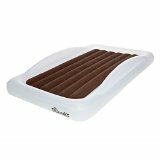 For older children, the Intex Cozy Kidz Inflatable Airbed is the perfect choice. It’s worth mentioning that this particular bed doesn’t have raised sides, so a younger child may roll out or fall off, but for older children who are more static in their sleeping patterns, this is a great choice to go for, especially because of the price – below $50. 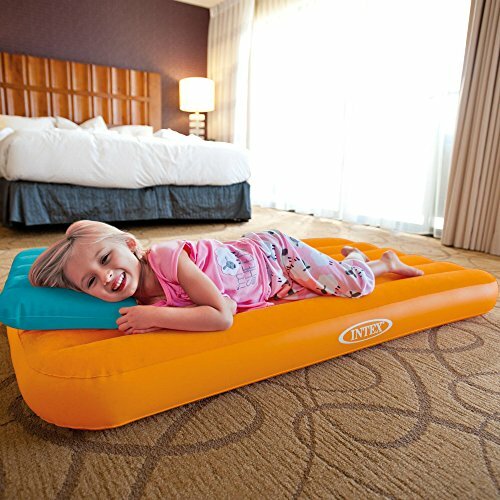 The waterproof flocked top comes in a variety of different bright colors, and the detachable and inflatable pillow means extra comfort as standard. There is a repair patch included. For older children, especially if you’re not going to travel too much, this is a great option. It can easily be stored in hand luggage when rolled up compactly. Click here for the latest prices and more information. My First Ready Bed is a great choice of portable bed for toddlers, and one which will allow younger children to feel support and safe. This is much more like a structured bed, which is great for little ones, and has an integral headboard which gives extra support for your sleeping child. The bedding is removable and washable, and the included pump means the bed is inflated and deflated quickly and easily. There is an included bag to transport the whole thing. It is also a fun choice with many different designs like Thomas the Tank Engine and Paw Patrol. The downside? This particular choice is suitable for children aged 18 months to 3 years, so if you are looking for a long lasting option this is perhaps not for you. For younger children, this is a great way to help them feel settled and snug whilst on the move. Read our guide to all the toddler travel gear you might want to think about for your next trip. 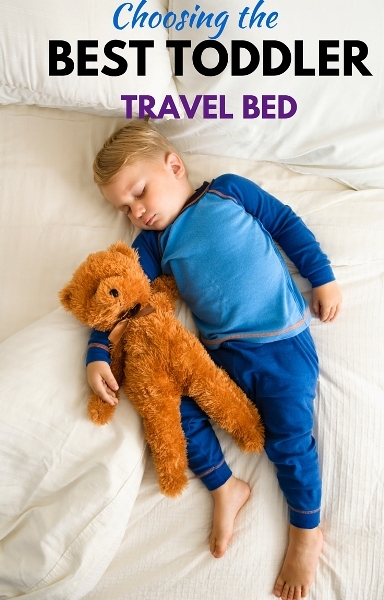 You can find more information on the best toddler travel beds here. Do you travel with a toddler travel bed? Do you prefer inflatable toddler beds or a fold out toddler bed? Disclaimer: Where’s Sharon is a participant in the Amazon Services LLC Associates Program, an affiliate advertising program designed to provide a means for sites to earn advertising fees by advertising and linking to amazon.com and its partners. Amazon and the Amazon logo are trademarks of Amazon.com, Inc. or its affiliates. Thank you for supporting my site and helping me make it the best family travel resource on the internet!